Supreme walletry handmade and ready to ship! Matches the "Midnight Snack Domed Handbag". The smallest version of everyone’s favorite Necessary Clutch Wallet still packs a mighty punch! This adorable, mini version will hold just what you need. It fits into handbags where a large-sized wallet takes up too much space. brightly colored midnight snack motifs by Alexander Henry Fabrics features popcorn. The inside flap fabric is a bottle of soda, cherries and an ice cream cone. Measures approximately 5 ½ inches, 4 inches tall, and 3/4 inch wide. I only use quality YKK zippers in all my products and Pellon interfacings which will help the wallet keep its shape despite how much you cram in it. Flap fastens with a metal snap. Care instructions: Wipe clean as necessary. Do not machine wash/dry. Recommend Scotchguard treatment as needed. This item will be handmade by me, in my clean, smoke free, dog friendly home. Will combine shipping and return difference. 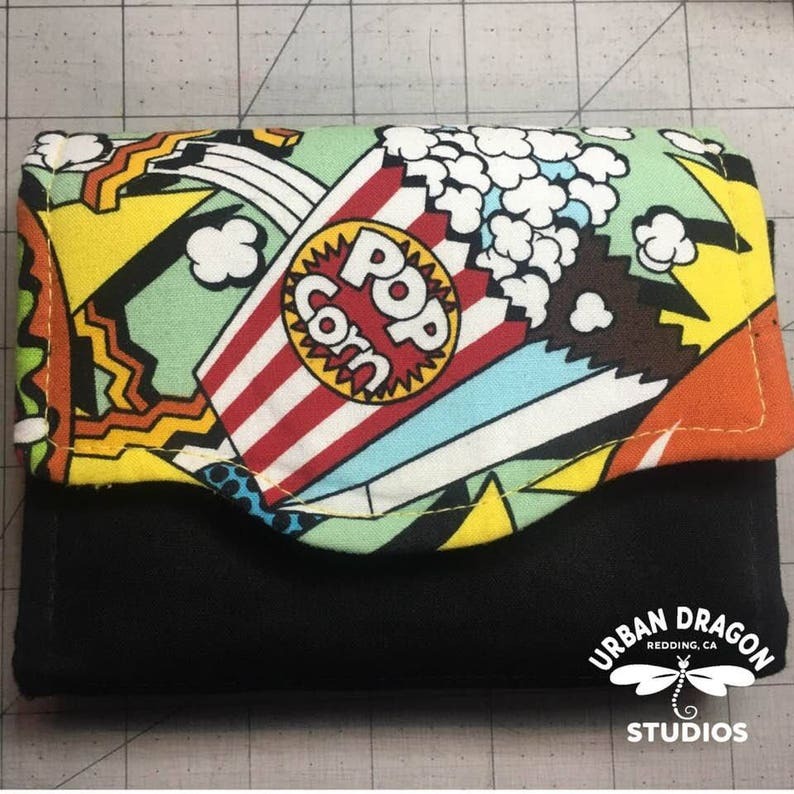 We love to see photos of Urban Dragon customers using our products. Use the hashtag #urbandragonstudios on Facebook or Instagram. This wallet was everything that I needed. Fits my checkbook which was a huge selling point for me. Made with very high quality work. Shipping was fast. Absolutely love it! High recommend this shop! This is so cute! Received quickly. Arrived yesterday. I love it. I absolutely LOVE this new pouch! It's super cute and is really well made. Even though it was a custom made order it arrived quickly. Will definitely order from UrbanFool again. Thanks, Kelly! Custom Vinyl Pouch for Nancy. I prefer PayPal, but will accept money orders and checks from a US bank. Please note that your order won't be sent until confirmation of payment. Uncle Sam says I must charge sales tax on all items sold to California addresses. This should be reflected in your PayPal invoice. If for any reason you are unhappy with your purchase, contact me as soon as possible and I will attempt to resolve any problem. I want you to be 100% happy. In most instances, I ship via the United States Postal Service, first class with delivery confirmation. I feel that this protects both the buyer and seller. If you need some other method of shipping, just let me know. The vast majority of my orders are mailed the same day. To my everlasting frustration, the mail does not run between 5pm on Friday and sometime in the evening on Monday, but I do try my best to avoid that time period. If you've ordered an item requiring creation, it will still probably be shipped within 1-2 days of payment confirmation. Possible delays will be discussed with you when ordering. I always ship to the address you provide to me here on Etsy at check out, so please be sure to use the address where you want your item to be shipped. For prompt service and the least amount of hassle, please make sure your shipping addresses for BOTH your Etsy account and your PayPal account match exactly or this may cause a delay in shipping. I will let you know as soon as your package is on the way. If you need an order sooner or you have any questions at all, please feel free to contact me and I will do what I can to help! I am always more than happy to help in any possible way! Business days are M-F excluding postal holidays. Please note that Christmas Eve, Christmas Day and New Years Eve are postal Holidays (Dec 24th, 25th & 31st). Other USPS postal holidays include: Martin Luther King, Jr's birthday, Washington's birthday, Memorial Day, the 4th of July, Labor Day, Columbus Day, Veteran's Day and Thanksgiving. No mail can be sent these days and they are not counted even if falling on an otherwise normal business day. Need more than one of something? Just let me know and I would be happy to adjust the quantity or create a custom listing for you! I love doing custom designs! See something in my shop that you want in a different fabric? Want to change the color of trim or zipper? Need monograms or embroidery? Want to add something or do something completely different? Contact me and I will be happy to work out the details with you! I have a slight fabric addiction, so I have hundreds of different fabrics. If I don't have what you need, I live within walking distance of two fabric stores. Sending a gift? I'm happy to include a note for you!